A place to uncover fascinating bits of random knowledge of the natural world. From the conservation of the endangered vaquita porpoise to the hidden wonders of the Bornean rainforest, and everything between. Knowledge is wonderful, so dive in and enjoy. This guy is a beast. More than two inches long and sporting a three inch wingspan, the asian giant hornet (Vespa mandarinia) is the largest wasp on the planet. Known also as the yak-killer, this wasp kills more people in Japan each year than all the other wild animals combined. Besides the usual tissue damaging bee and wasp stuff, its sting also contains a potent neurotoxin that can kill people who aren't even allergic. A voracious hunter, the giant hornet doesn't bother with his sting for hunting. Instead he just shreds his prey with massive, crushing mandibles. These savage predators have a particular taste for honeybees. A single hornet can kill as many as 40 bees per minute, cleanly decapitating each one with a single bite. It only takes a few hornets a few hours to completely destroy a hive of 30,000. At least, this is what happens with most bees. The japanese honeybee (Apis cerana japonica) is not such an easy target. You see, when a hornet scout approaches a japanese honeybee hive he is preceded by a powerful tracking pheromone. Detecting this scent, the bees go into immediate action. Five hundred bees gather at the hive's entrance, leaving an enticing path into the hive wide open. As soon as the scout enters, the trap is sprung. Five hundred angry honeybees close in on the suddenly trapped hornet. 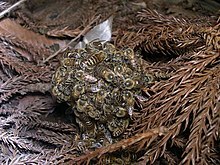 Forming a tight ball of angry death, the vicious swarm wraps the hornet and each individual bee begins to vibrate. The air around the hornet is sucked dry of precious oxygen and driven to a sweltering 117 degrees fahrenheit. The hornet is baked to death and the bees are now safe. This is just a wonderful example of coevolution. As the hornets evolved into terrible killing machines, the bees evolved a behavioral antidote. Can anyone reading this doubt that the earth is truly a wonderful place? There is so much cool stuff out there, I doubt a single lifetime could ever be enough to explore it all. Wow!!! That's all I have to say - Wow again. Wow is right! This was so interesting and the pictures are awesome! Thanks everybody! I'm glad you enjoyed it. Everything given to Knowledge is Wonderful will be put towards my college education, so that I might pursue my dream of becoming a research scientist and discovering nature's wonders with my own eyes. A single dollar would mean a great deal. Thank you in advance for supporting my dream.